This penne alla vodka is tender penne pasta tossed in a rich and delicious tomato, vodka and cream sauce. Add a sprinkling of parmesan cheese and you’ll have a restaurant quality meal in the comfort of your own home. I always order penne alla vodka at my local Italian restaurant. That creamy and flavorful sauce just can’t be beat! 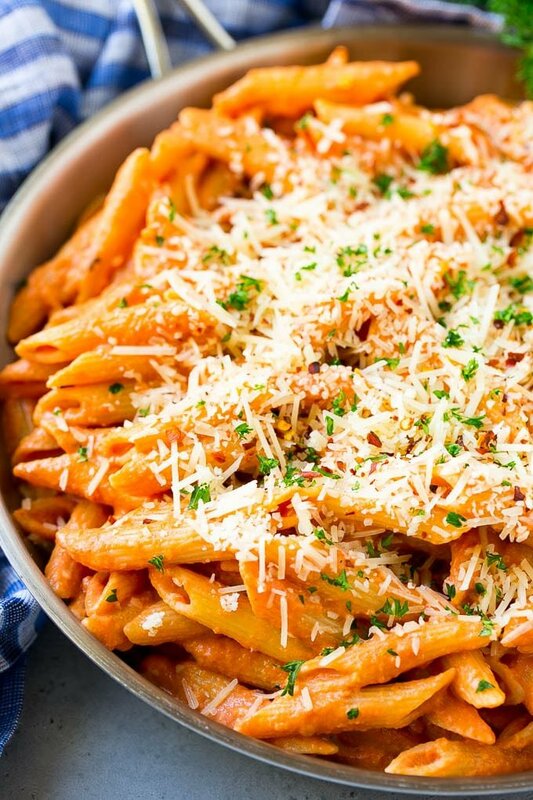 Luckily it’s super easy to make penne alla vodka – in 30 minutes you’ll have an amazing dinner on the table. Try this dish with some grilled chicken or grilled shrimp for added protein! 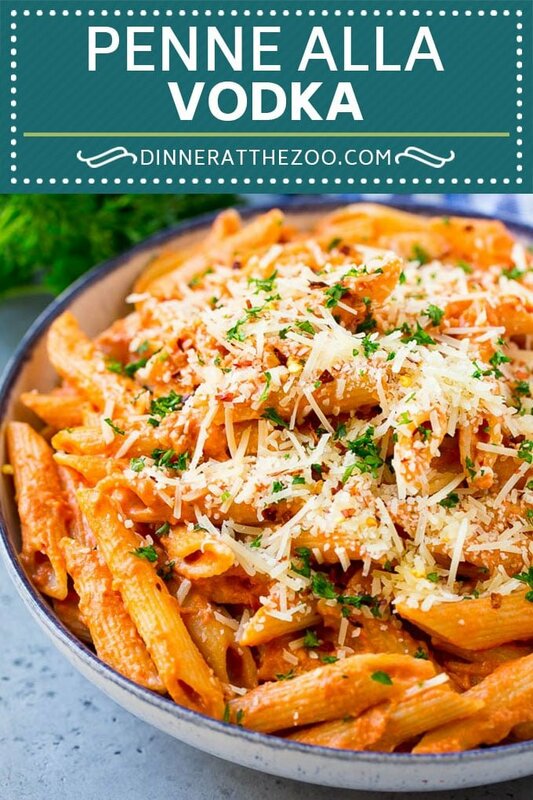 Penne alla vodka is one of those simple recipes that has minimal ingredients but is just so delicious and satisfying. My homemade version tastes just like the dish I get at our local Italian restaurant. 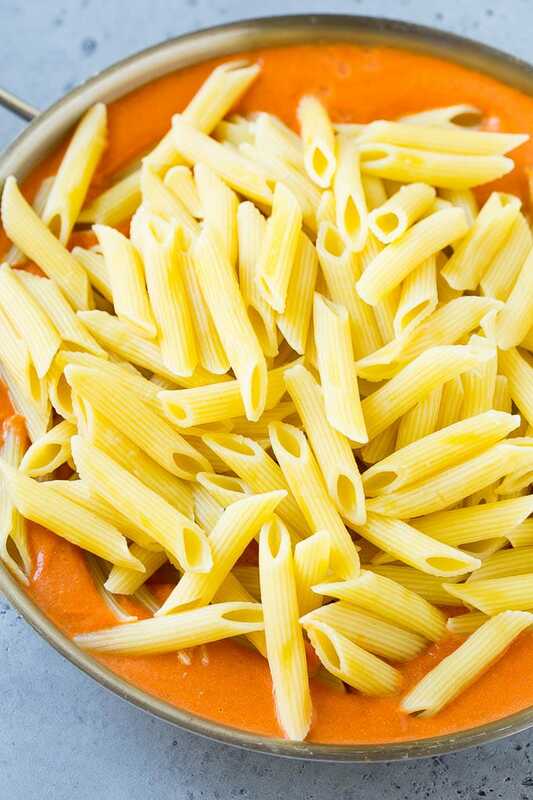 The key to amazing penne alla vodka is to get the best quality ingredients that you can afford. How do you make penne alla vodka? The first step is to put your pasta up to boil, and while the pasta is cooking it’s time to make the sauce. I use penne pasta since that’s the traditional shape for this dish, but you can use other short pastas in a pinch such as rigatoni, rotini or cavatappi. The vodka sauce starts with sauteed garlic, butter and tomato puree. I use canned San Marzano tomatoes in this recipe. They’re a type of Italian plum tomato and they have the best flavor of any type of canned tomato. If you can’t find a can of San Marzano tomatoes, use Italian style whole canned tomatoes instead. It’s definitely worth the extra money for the San Marzano variety. Does vodka sauce have vodka in it? Yes, vodka sauce does in fact contain vodka which is how it gets its name! 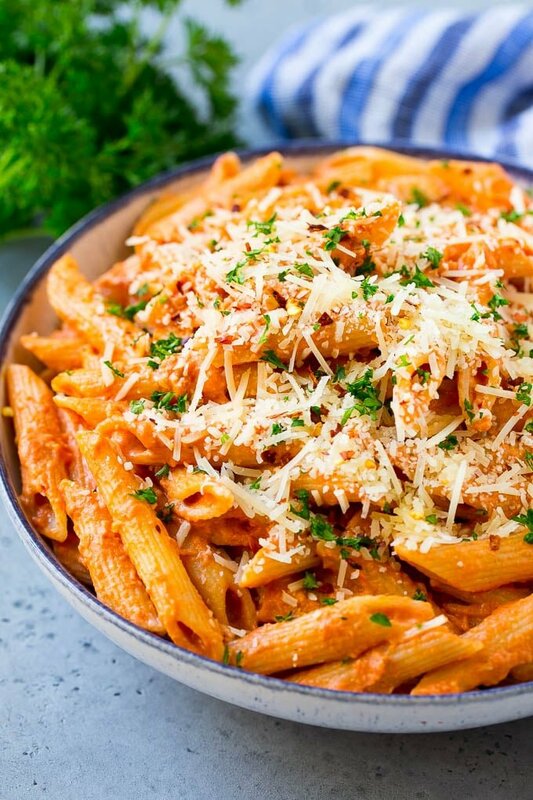 The vodka adds a unique flavor to this dish, but it simmers for long enough that the alcohol boils off so there’s no danger of getting intoxicated from eating pasta! 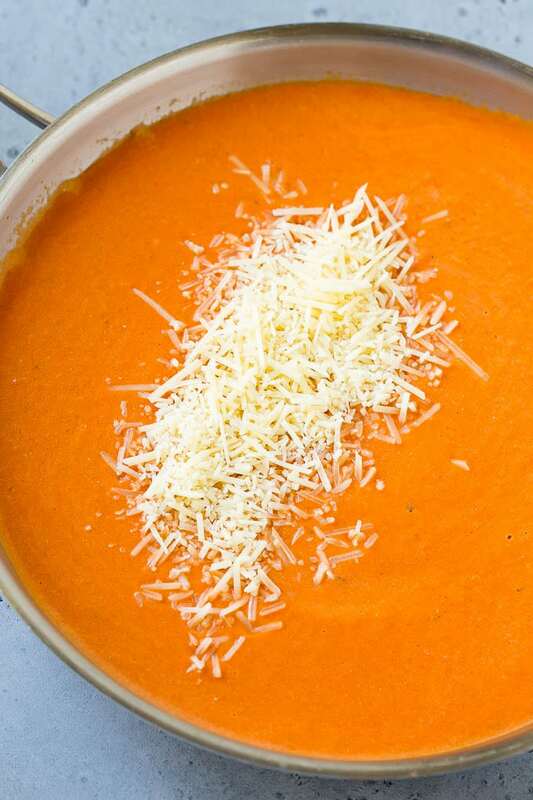 Vodka sauce is enhanced with some heavy cream and plenty of parmesan cheese. Do not use the green can of parmesan cheese for this dish. Look for a high quality grated or shaved parmesan, or buy a block of it and grate it yourself. The last step is to mix your pasta with the sauce, add some garnishes, then eat! I add more grated parmesan, crushed red pepper flakes and parsley to the top of my penne alla vodka. If you’re not a fan of spicy food, you can easily leave off the pepper flakes. The parsley adds great flavor and color, but fresh basil would also be a great choice. Make sure you let the sauce simmer for long enough so that the alcohol will cook off. If you don’t cook the sauce for long enough, you may end up with a harsh aftertaste from the alcohol. This dish is great as is, but you can add in other ingredients to make it your own such as Italian sausage, meatballs, zucchini, mushrooms or olives. You can make this sauce a day before you plan to use it. Simply reheat it on the stove while your pasta cooks, then toss everything together and serve. This vodka sauce is so good that sometimes I skip the penne altogether and use ravioli or tortellini instead. You could even use this sauce in a lasagna but a fun twist on an old classic. 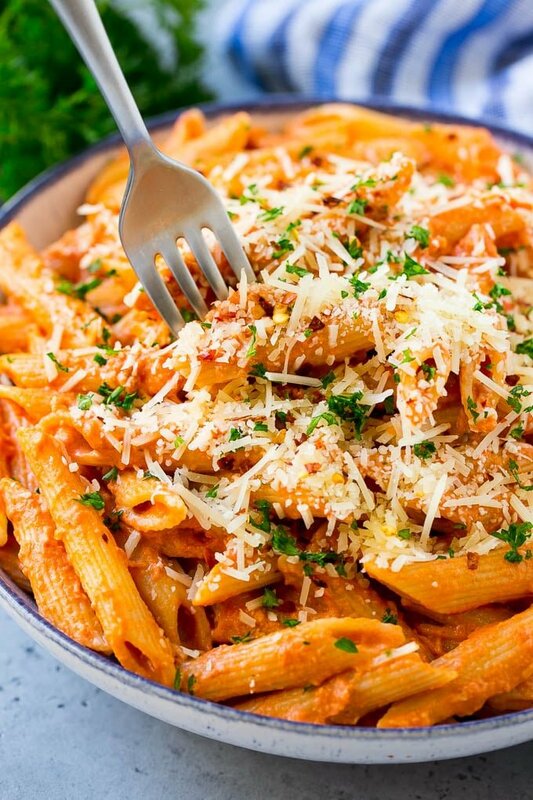 When you’re in the mood for Italian food, definitely give this penne alla vodka a try. You’ll be surprised at how authentic (and delicious) it is! 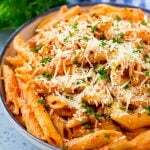 This penne alla vodka is tender penne pasta tossed in a rich and delicious tomato, vodka and cream sauce. Add a sprinkling of parmesan cheese and you'll have a restaurant quality meal in the comfort of your own home. Cook the pasta in salted boiling water according to package directions. Melt the butter in a large pan over medium heat. Add the garlic and red pepper flakes and cook for 30 seconds. 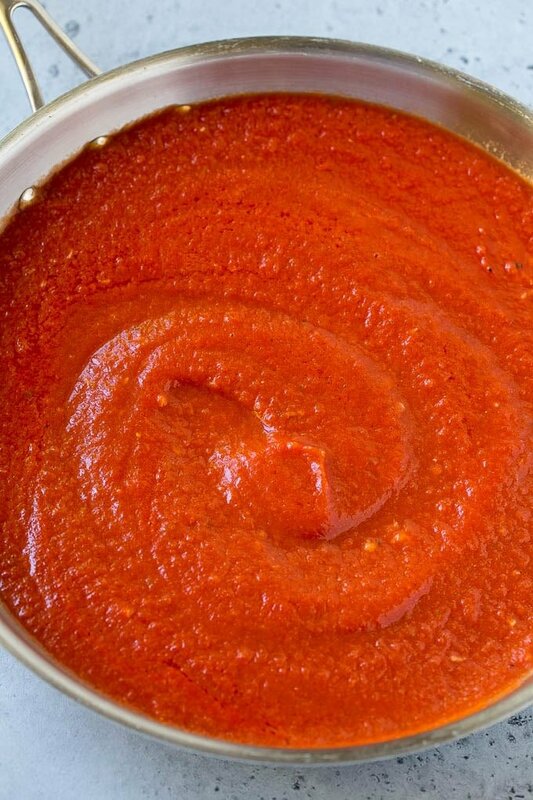 Place the tomatoes in a blender or food processor and puree until smooth. Pour the tomato puree into the pan. Add the vodka to the pan. Simmer the sauce for 10 minutes over medium low heat. Stir in the heavy cream and parmesan cheese and simmer for another 5 minutes or until thickened. Season the sauce with salt and pepper to taste. Pour the sauce over the pasta and toss to coat. Sprinkle with parsley, parmesan cheese and red pepper flakes (optional), then serve. Do you think this would taste ok without the vodka? Normally I’d have no problem with it but I am pregnant and don’t want to cook with alcohol- just being extra cautious 🙂 When the baby is here, I’ll make the recipe as is but for now, I’m craving a flavorful creamy tomato sauce sans vodka!!! Yes I’ve made it without the vodka and it’s still totally delicious! I’m not the best cook, but this recipe was easy( right up my alley) and tasty. I did add some spice to give it a little kick. Family loved it. On my list to make again. Wow, this is really an original recipe for pasta that I actually can make, it doesn’t look difficult! Wow, this looks so good! That sauces looks especially tasty! I’m going to have to add this to our meal time rotation. I don’t know if I’ve ever made my own Penne alla Vodka before, but I do love it – best of both worlds between marinara and cream sauce! I’ll have to give your recipe a try.